Are you planning some theme park family fun this spring or summer? 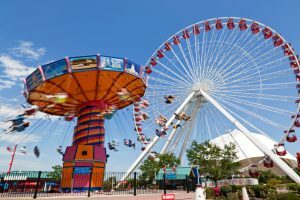 There are amusement parks throughout the country that honor service members with great savings. So before checking out that new rollercoaster, check out these special theme park discounts available for the military. Cedar Point – Military personnel receive $21 off a regular all-day admission ticket. Offer is available only at the Gate, not online. Discount applies to active, retired and honorably discharged members of the military, as well as their family members. Limit 6. Throughout the year the park also holds special Military Appreciation events. Dollywood – Active or retired military, disabled veterans, military reservists, spouses and dependents are entitled to receive a 30% discount on one-day admission tickets. Tickets must be purchased at the front gate. Kings Island – Kings Island in Mason, Ohio offers free admission to active and retired military personnel during Memorial Day Weekend, May 23-26 and Fourth of July Weekend, July 3–6. Military personnel can also purchase up to six discount admission tickets for their immediate family members. Service members may be entitled to other admission discounts throughout the year. Inquire at the Front Gate for details. Knott’s Berry Farm – Starting on Veteran’s Day and lasting through the beginning of January, Knott’s Berry Farm runs its annual “Military Tribute” which honors active and retired military and veterans with free admission for them and a guest. Up to six additional tickets may be purchased at a deep discount. During the rest of the year, active military can purchase discounted regular admission tickets for $38 when you show your Military ID. Discount does not apply to Special Ticketed Events. LEGOLAND® California – Active duty military can receive 10% off a one-day admission ticket. Tickets can be purchased at the ticket booths or Guest Services. A greater discount may be available if tickets are pre-purchased at an on base Military Ticket Office. LEGOLAND® Florida – Active service members, including Army, Navy, Marines, Air Force, Coast Guard, National Guard, and Reservists, can receive one free admission to LEGOLAND Florida and seasonally at the LEGOLAND Water Park. Family member discounts are also available. Complimentary admission is good for military personnel and up to three direct dependents. You can register online to save time. Six Flags Great Adventure, Magic Mountain and Great America – Most military bases offer discounted admission tickets at their MWR/ITR offices. Universal Studios Hollywood – Universal Studios Hollywood offers greatly discounted tickets to active and retired service members all year long. These specially priced tickets are only available at participating MWR/ITT offices or through the phone, and are not available at the ticket booth. If you do not pre-purchase a ticket, military personnel and their dependents can still receive a 10% discount off General Admission tickets by showing a valid Military or U.S. Government ID at the ticket booth. Walt Disney World Resort – Now through September 24, Walt Disney World Resort in Florida is offering a Disney 4-Day Military Promotional Ticket (includes the Park Hopper Option) for just $169 each, plus tax. See website for blockout dates and other restrictions.